Dhirendra Mulkalwar, one of the protestors who raised a protest banner at Essar's Mumbai headquarters recently, on why he joined Greenpeace's Junglistan group that is working to save India's forests. I was not wearing a watch. But time did not matter. At the top of Essar's 21-storey headquarters, we entered a zone where time was inconsequential. The job at hand kept us occupied -- our team of 14 climbers had scaled the building and had already draped it with a 36 ft x 72 ft banner. 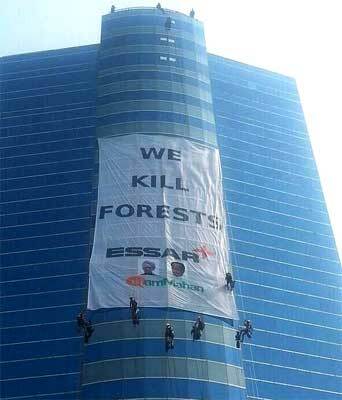 It read: 'We Kill Forests: Essar'. I looked down, a crowd seemed to have gathered on the ground, but from that height, they all looked like ants. Time, space, size everything was literally compromised. When I came down, it was evening -- a police van greeted us with its doors wide open. The rest of my team members were hauled up to the roof by a fire brigade crew. I was told that we had been up for five hours. It was only in the police lock-up that time began to stretch and the night seemed endless. The lock-up was not enough to fit all the 67 of us. Many of us had to sleep outside the lock-up. There were 14 climbers, 27 people from the Mahan forests in Singrauli, Madhya Pradesh, and the rest were youngsters of Mumbai, who like me, had signed up with Junglistan -- Greenpeace India's longest running campaign. The movement has inspired over a million people to take a vow in order to protect the forests of India from getting butchered. We were just a small fraction representing those million voices and the policemen knew we were fighting for a cause. The villagers from Mahan had travelled all the way to Mumbai to reach out to the high and mighty in Essar. These people stand to lose their livelihoods and homes to a coal mine allocated to Mahan Coal Ltd -- a joint venture between Essar Power and Hindalco. The rich forest of Mahan is the main source of income for these villagers. It provides for them -- an austere yet comfortable lifestyle. Of course, they have to toil hard for it -- but the hard work pays off, when you work in harmony with nature. Collecting mahua flowers, tendu leaves and firewood, and grazing cattle cannot be compared to the apocalyptic effect that the mine would have on the forest. There are 14 villages in the region that are completely dependent on the forest for their daily bread. With a canopy density of 70 percent, the forest harbours some 164 species of plants including sal, saaja, mahua, tendu among others. Several threatened and rare animals such as leopard, sloth bear, hyena, wild dogs, chinkara, chousingha, nilgai and sambar have been co-existing together in the forest for ages. Even vultures such as the white-rumped Gypsbengalensis and Indian Gyps Indicus and the red-headed Sarcogyps Calvus, which are on the verge of extinction can be seen in these forests. Tigers and elephants too have been spotted here. But the Mahan coal block threatens to devour it all. Ninety four percent of the 1,182.35-hectare-coal block is pure forest. The Mahan coal block now awaits the Stage II forest clearance. It got the Stage I clearance (in principal) in 2012 by an empowered group of ministers. This, despite the fact that the former Union environment minister, Jairam Ramesh, had declared Mahan, a no-go zone -- which means no mining activity could take place in the forest. However, the Stage II clearance can only be granted if 36 conditions are fulfilled, which includes implementation of the Forest Rights Act. This means, communities living in the villages need to give their go-ahead to the mining proposal. This can be done only through a free and fair gram sabha. Unfortunately, not a single community forest right has been implemented in the region. The only gram sabha on FRA was held in Amelia village in March 2013, and in no way can it be termed as 'free and fair'. The final gram sabha resolution, which gives the NoC to the coal mine, has fake signatures of many villagers. What is even more shocking, it has signatures of residents who have been dead for over two years. Saner voices in the United Progressive Alliance government, like that of Union Minister of Tribal Affairs K C Deo, have come out in support of people in Mahan, but it is the more impatient people in the government who pose a threat. The new environment minister, M Veerappa Moily, is in a hurry to clear big ticket projects and is already said to have granted clearances to projects worth Rs 1.5 lakh crore in a matter of a few weeks. He has vowed not to rest and clear all pending files by February. Mahan's future thus hangs in the balance. The coal block in the region will feed a 1,200 MW thermal power plant owned by Essar Power. "We will produce electricity. We are pro-development. You are clueless youngsters living in cities, who know nothing about ground realities," an Essar manager tried to lecture me when I came down. Whose development was he exactly talking about? I come from Chandrapur, a small town in eastern Maharashtra, which was surrounded by forests. Slowly, coal mines started eating into the forests. Now, Chandrapur has mines on three sides, while on one side is the Tadoba-Andhari Tiger Reserve. Today, Chandrapur boasts of producing 8,000 MW of electricity, yet everyday for 16 hours, my native town is plunged into darkness. The manager did not have a lecture to counter this argument. In Chandrapur, this slow devouring of forests has led to numerous man-animal conflicts. As a volunteer with an organisation called Eco-Pro, I have been a part of many animal rescue operations. Twice, I have even led operations to rescue leopards, which have strayed into villages and even killed people. Through the 25 years that I have lived, I have seen Chandrapur transform from a sleepy town where you could breathe fresh air, to a smoke-filled chimney where you gasp for breath. Mahan too awaits a similar fate. I migrated to Mumbai -- to start my career as a music composer. Given my sound educational background, it was relatively easy for me, but it may not be easy for the villagers of Mahan. Will they ever get back their trees, animals and the fresh air they breathe? Some land in Sagar district, which is 500 km away from Singrauli, has been earmarked for afforestation, but no amount of afforestation and compensation is enough for these people. Many of them have been displaced as many as four times because of mining, hydropower or other big ticket infrastructure projects. I am a composer. Yet, I did not find it difficult to understand that for real development to take place, the energy map of India, which is highly dependent on coal-based power, needs an overhaul. In such a scenario, cleaner and renewable sources such as solar and wind energy seem to be the only way out. Unfortunately, people with higher degrees and cushier offices still fail to understand the true meaning of sustainable development. Image: Protestors raise a banner outside the Essar headquarters in Mumbai. Dhirendra Mulkalwar, a Mumbai-based composer, volunteers for organisations like Eco-Pro and Greenpeace India.